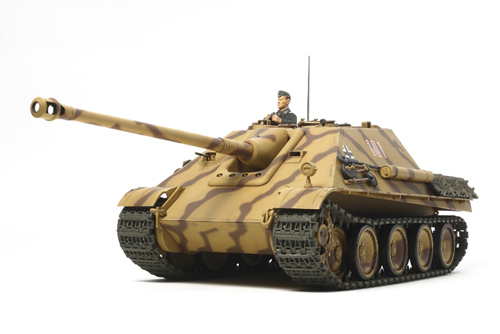 1/25 German Jagdpanther Model Kit Discounts Apply ! TAM30607 - 1/25 German Jagdpanther Model Kit. The Jagdpanther is regarded as one of the best tracked weapon systems during WWII. The awesome Pak43/3, L71 88mm gun was mounted on the proven Panther chassis. The gun was installed into the box shaped superstructure which featured steel armor of 80mm thickness at the front and 50mm thickness on the sides. The armor was also sloped for improved protection. The Jagdpanther weighed 46 tons and was propelled by a powerful Maybach V12 engine. These tank destroyers were characterized by a good balance of fire power, protection, and mobility.